There are many benefits of metal, the primary one being its durability. But metal roofing has evolved way beyond the old barn roofs of the past. Here are some reasons why the only choice for your next roof should be a metal roof. Metal roofing lasts forever guaranteed. Asphalt Shingles typically lasts 8-12 years before requiring replacement. Whereas a metal roof lasts 75-100+ years with little or no maintenance. Metal roofing can reduce your heating and cooling bills up to 30%. In summer or warmer climates, metal reflects the sun’s rays that keep your home cooler and lower your air conditioning bills. In winter, the added insulation factors of metal can retain the heat and reduce your heating costs. Unlike the old barn roofs, today’s metal roofing comes in a variety of styles, ranging from the simple screw-down model to metal shingles, which have the appearance of asphalt shingles with the longevity of metal. They also come in a variety of colors, from the subtle to the dazzling. You probably never thought you could have a roof that reflected your own personality. 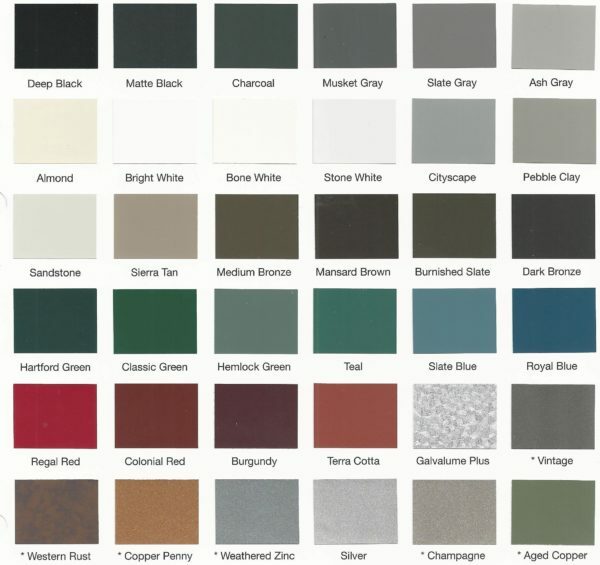 Click here to see the various range of colors. Also check out our photo gallery and video gallery to see just how beautiful a metal roof can be. Whether you plan on living in your home for years to come or are planning to sell it soon, metal roofing can greatly increase your home’s value. As reported by Sal Alfano of Remodeling Magazine, homes renovated with standing-seam metal roofing show a rate of 85.9% cost recouped in the national average with up to 95.5% for homes in the Eastern states, a full 1 and 6% resale value gain over homes roofed with asphalt. And with all the added safety and longevity associated with quality metal roofing matching installation job costs that reach only one half of that of cosmetic room remodeling averages or even one eighth of that of a master suite addition, you hardly deny the sense in upgrading. Did we mention that it’s durable? It will last for years beyond standard asphalt shingles. Watch the video below to see examples of metal roofs that have lasted hundreds of years. Still think Asphalt Shingles are a viable option? Watch the Video below and look at the history of Asphalt Shingles from the begging to their decline. Call us now for a free consultation (800) 491-5115.